Celebrate the places that mean a lot you! The street you grew up in, your 'big day' location, or the city or suburb you love. We create custom Cushys so you can celebrate the locations special to you. Cushy Locations has a casual stall at St Kilda Esplanade, appearing around once a month. We also appear at other markets in the Bayside area from time to time. Follow Cushy Locations on Facebook and Instagram to hear where we are next appearing. 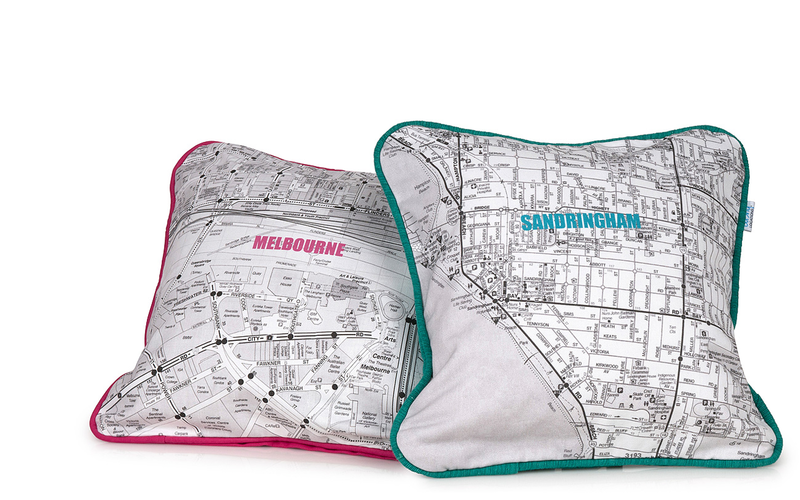 Cushy Locations can produce a cushion showing any location that is available on a UBD map. Thanks to UBD for allowing the purchase of a licence to reproduce map art. Keep your cushy location beautiful. To order your very own custom Cushy phone, or email with the address you want to appear on the cushion. The cushion size and the colour trim and background. Note that due to fabric printing time custom Cushy orders currently require a minimum of 4 weeks to produce. There is also a number of colours available in two fabric types. Colours available will change from time to time, depending of the stock available. If there is a colour you require please contact Cushy Locations to see if it can be sourced.